Born and raised in the quaint sugar plantation village of Pa‘auilo, Hāmākua, Island of Hawai‘i he is the youngest in a family of 12 children. Earl fondly recalls family life in a small community. “Music was always a part of our family,” says Earl, “I can’t remember one day there wasn’t music present – whether it was live or played on a record player. Being “young and carefree” lasted only about 18 years for Earl. Only six months after graduating high school, Earl enlisted in the military, he credits the military for transforming him from a young boy to a man; and later for allowing him to continue his education. 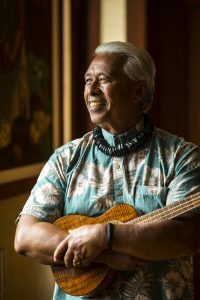 In 1996, Earl joined Hualālai Resort as one of the mea ho‘okipa – or hospitality ambassador – at Ka‘ūpūlehu Cultural Center. In 2006, he became manager of the center and was ordained by Universal Ministries. He now performs weddings and blessings, which adds another fulfilling facet to his colorful life. Earl’s humble upbringing, life experiences, and love for the culture make him the perfect ambassador to share Hualālai’s and Hawai‘i’s values and culture with those from here and beyond. If anyone has the pleasure of meeting Kaleolani, you will notice her knowledge of the art of ulana lauhala and love for quilting, hula and lei making, a big change from being a dental technician, which she was for 30 years. 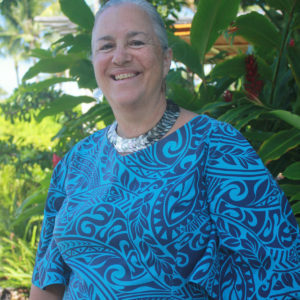 She has been a mea ho`okipa at the Cultural Center since 2005. 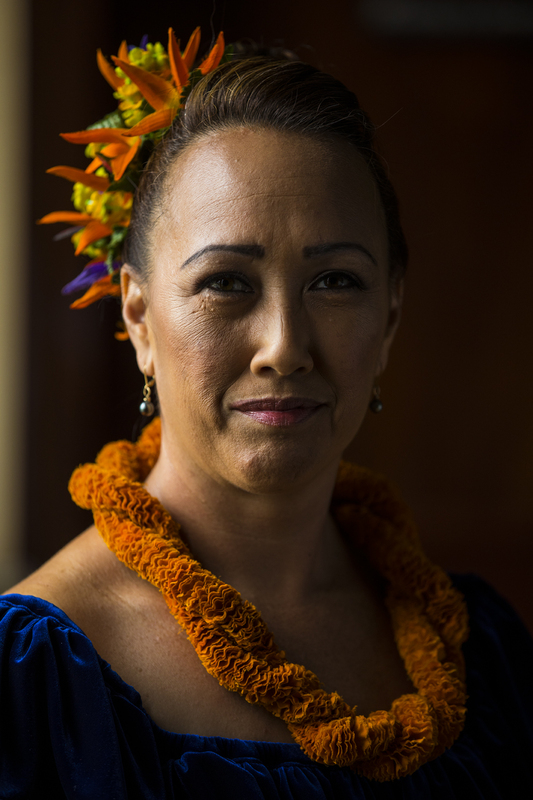 She has learned the traditions of the Hawaiian culture from many cultural specialists. She studied hula under Kumu Aunty Lani Kalama and Aunty Healani Kekela, Hawaiian quilting from Lillian Macedo, weaving from Aunty Elizabeth “Maluihi” Lee and Uncle Peter Park, and the art of haku lei making from Kalili Hansen. Her knowledge expands to the art of Hawaiian implements; `ipuheke, `uli`uli puniu, pu`ili and `ohe hano ihu. Her passion for plants has led her to Marie McDonald’s farm in Waimea and Aikane Nursery in Hawi. She was an Ethno Botanical Intern with Amy Greenwell Bishop Museum. At one time she had her own landscaping business which specialized in flowerbeds. Originally from Oakland, California, arrived on the Big Island in1984 and married her husband Don in 1985, they have a son Brian who lives in Sunnyville, California. When she is not here she enjoys plant material gathering for lei making and lauhala weaving, which she visits Kohala frequently, where her ancestors are from. Her discovery revealed that her great great grandmother was from Kohala and practiced La`au Lapa`au and also was a mid-wife.